We were recently kindly sent all of the ingredients to make an early Christmas dinner from the lovely people at Donald Russell. It is a name that is well known in the world of food suppliers and to be honest is one we have used at Christmas in the past. For over 40 years, Donald Russell has passionately upheld the highest standards of craft butchery. We hold a Royal Warrant and are renowned for the quality of our hand cut steaks and roasts. Our small team of Aberdeenshire butchers made our name serving some of the most prestigious hotels and Michelin-starred restaurants worldwide.Today, you can experience this exact same quality in the comfort of your own home, joining thousands of customers who have discovered the Donald Russell commitment to taste and quality. 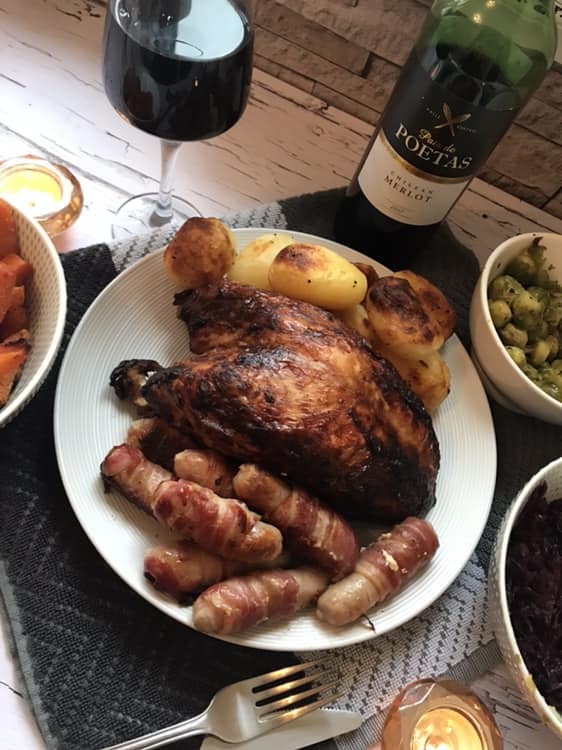 We were sent the turkey crown in gravy, which amazingly only takes one hour in the slow cooker or oven, Christmas dinner isn’t right without pigs in blankets and the ones we were sent were beautiful, lovely and moist with the bacon still crispy after baking. I cooked ours in the oven and the convenience of the side dishes was great. For something a little different we were sent the Christmas veg selection which is currently on offer for £20. This contained 2 Goose Fat Potatoes 200g each, 2 Honey Roast Parsnips 200g each, 2 Braised Red Cabbage 200g each and 2 Brussel Sprouts with Shallots and Bacon, 200g each. Enough for 4 people. No extra pans to wash up and nothing more than the baking tray all of the containers were placed on for cooking to put away. Overall we loved the convenience of having everything ready to pop into the oven and be cooked in under 2 hours. The value and taste of the produce was delicious and I would highly recommend thinking about doing a one stop shop at Donald Russell if you are looking to ease some of the pressures this Christmas! We were sent this for the purpose of the review, all views and opinions are our own and genuine.